When I cannibalized the parts camera, I took the lens off (probably the only part of that camera which was in decent shape) hoping to one day adapt it for use on a Leica M body or something similar. Well, the lens wound up, like a lot of my projects, kicking around in a drawer for years and just gathering dust. 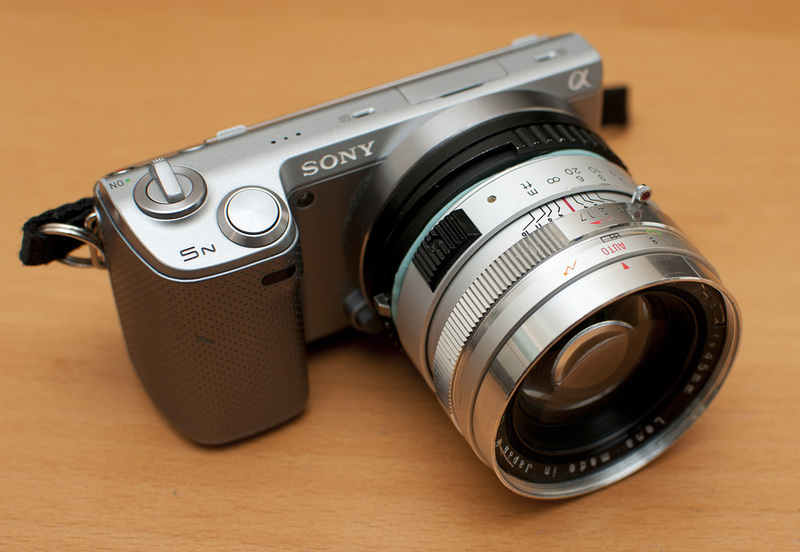 Then the NEX series of cameras came along and with them adapters for every conceivable lens imaginable. Slooowly, eventually, the dim flashbulb in my head went off, I remembered the long forgotten GSN lens and I got to wondering if and how I could pair it with my NEX 5n. In hindsight I should have obviously left at least a part of the focusing hardware in place so at this point whatever was going to focus this lens was going to have to be an external thing. 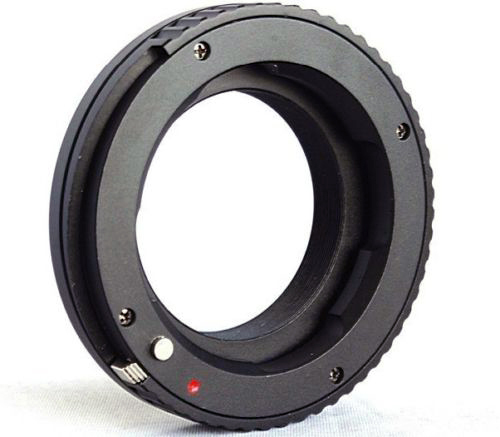 This is where one of my favorite adapters for the NEX series of cameras comes in; Sony E-mount adapters that have a helicoid built in which are meant to allow for close(er) focus with M-mount lenses. These adapters have gotten dramatically cheaper as more Chinese made versions have become available. If you search eBay for “nex helicoid” you will find plenty in the $35-$40 range which is likely the same as the one I have. There is even one that goes for about $18 that can be found by searching for “tinray helicoid”. At the moment, and as you can see from the photos, this is in the prototype stages and I am simply using blu tack to fix the lens to the adapter. 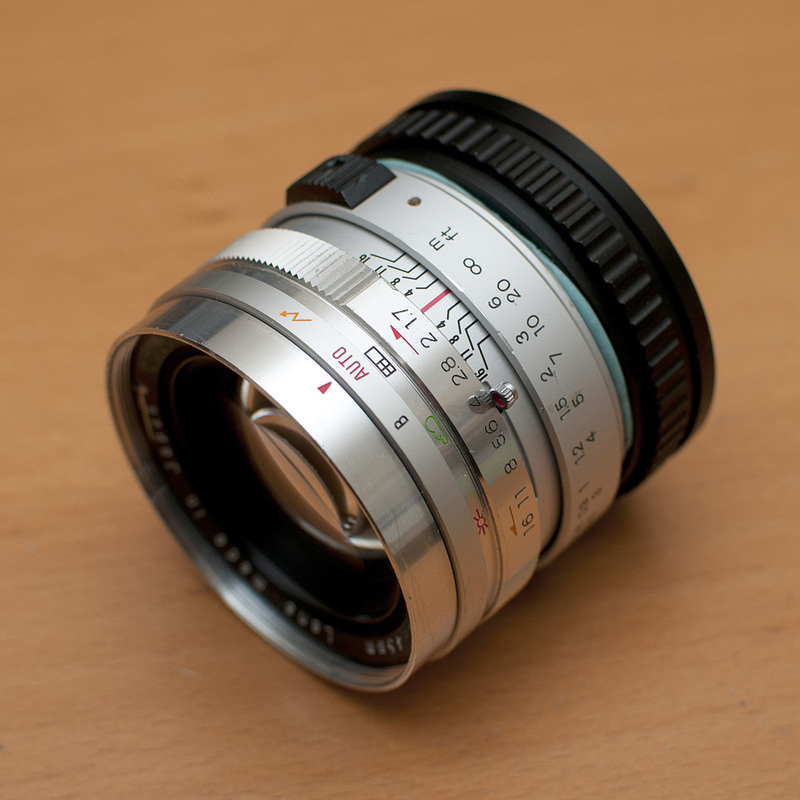 I was actually lucky to have removed as much of the focusing mechanisim as I did because in this setup with this particular helicoid adapter infinity focus is very close to spot on. It currently focuses just a little bit past infinity but I plan to shim that when I do the final mounting. 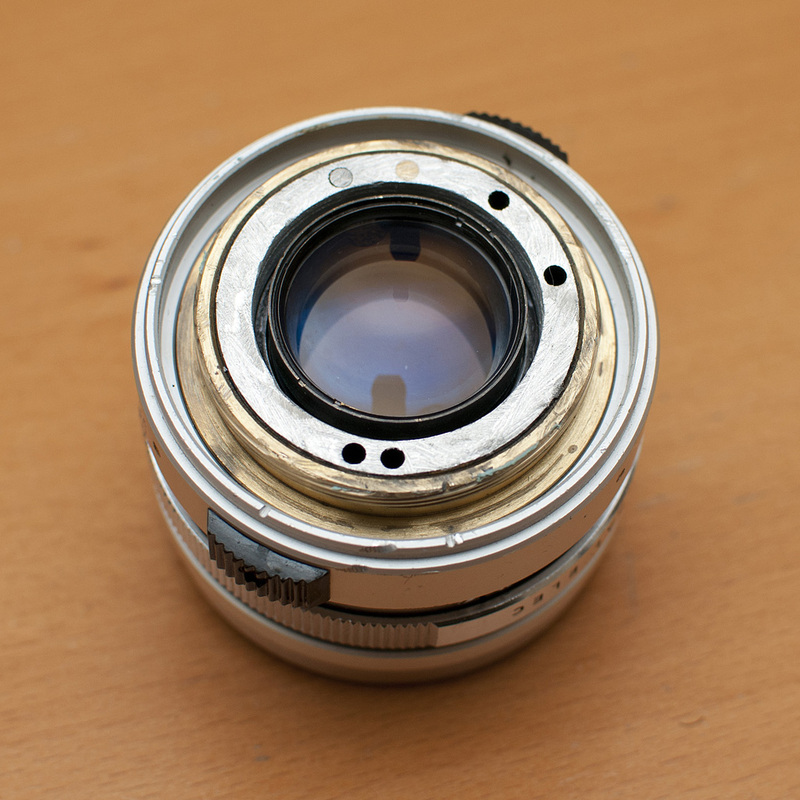 Eventually, I want to get a Hawks v3 helicoid adapter (much better quality!) for use on my a7R. 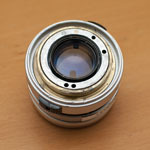 I will then use some JB Weld on this adapter to permanently fix the GSN lens to the helicoid. I’ll update this page when that happens. Shortly after I bought my MX7C I read that the hardware in the MX5C and MX516 were the same and all that needed to be substituted was the CCD chip. I contacted Terry Platt of StarlightXpress and asked if this was the same for the MX7C line of cameras. Happily this was the case and I put in an order for a Sony ICX249AL CCD chip directly to StarlightXpress. If you’re not squeamish about this sort of surgery, the swap is not hard to do and a fairly painless calibration is all you need to do to be up and running. However, I’ll insert the standard disclaimer here: This sort of thing voids your warranty. If you’re not comfortable or don’t know what you’re doing, try and arrange for the camera to be sent back to StarlightXpress or a local distributor and they will most likely do this for you. I have no affiliation with StarlightXpress nor is the information in this article endorsed by them in any way. Its something I did myself and wanted to document in case others out there were interested in doing the same. First lets take a look at opening the camera. The picture to the right is confusing but there is method to the madness. The view is of the rear of the camera. 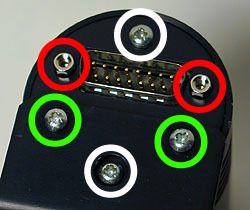 The 2 screws circled in green only hold the tripod adapter in place. 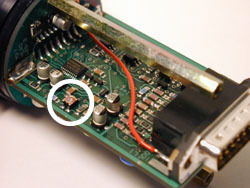 The hexagonal nuts circled in red hold the back plate of the camera to the 15 pin plug that is soldered to the circuit board. These must be also be removed. Once the back plate and the camera housing have been removed you will notice a long brass bolt on each side of the camera. 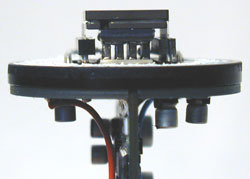 These bolts hold the front part of the camera in place – the metal housing for the CCD to which the optical window is attached. thermal heat sink grease as you can see in the picture on the bottom right. If you are going to do this it would be a good idea to get some computer silicone heat sink paste (a.k.a. thermal grease). at RadioShack or on-line. The grease under the chip on my camera was completely dry and I had to clean it and reapply some. Remember though that a little goes a long way with this stuff! While you’re at Radio Shack pick up an antistatic bracelet. CCD chips (like most electronics) can be easily destroyed by a static discharge and it is always good practice to keep yourself grounded. Here is a close up of the chip. The easiest way to remove it is with a thin flathead screwdriver like in the image or prying it up with an x-acto blade. Alternatively, places like RadioShack have specific tools for inserting and removing chips from sockets without damaging the pins. The trick is to gently lift one end and then the other off of the cold finger until the chip comes loose. It is very easy to bend the pins if you aren’t careful. Note the notch on the left side of the chip. This is not pin 1. 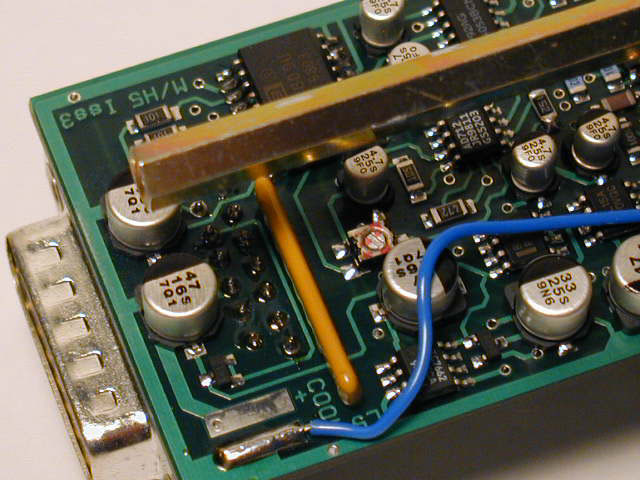 (It is in fact close to pin 10) It is there, I assume, for leverage to make removing the chip from a socket easier. 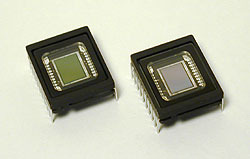 Pin 1 on these chips is marked by a circular indentation on the underside of the CCD. Since the notch is easily visible I used it to mark the orientation of the chip in the socket. This is very important to take note of. 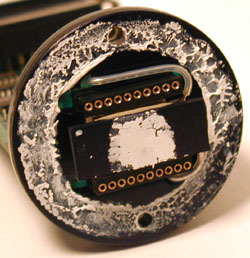 If the CCD chip is incorrectly inserted you could destroy the CCD and possibly the camera. 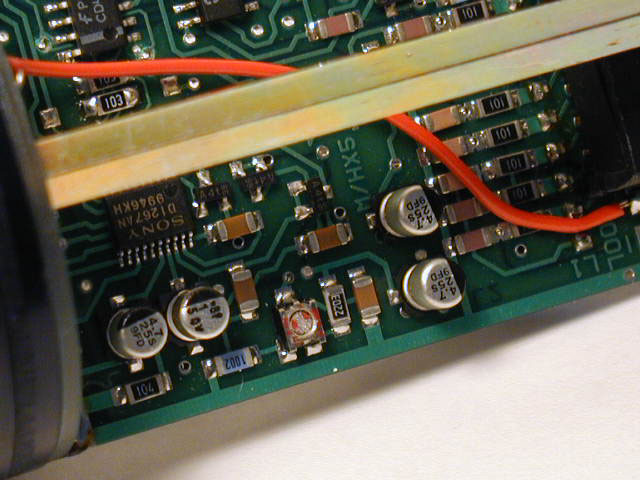 That said though, the Sony CCD chips are very similar and pin 1 (or 10) should be easy to identify. I used a drop of liquid paper to mark the position of pin 10 on the cold finger for future reference. In the bottom picture you see the cold finger with the CCD removed and dried grease I had to replace. The grease around the edge of the camera was thick but holding out so I left it. It is there to make the enclosure airtight and prevent moisture condensing and then freezing on the CCD chip as it cools down. This was a major problem I had with my CB245. 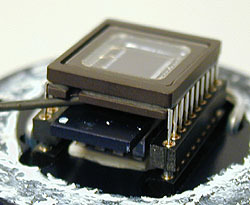 This image shows the CCD mounting as seen edge on with the new chip installed. Under the CCD is the cold finger and under that is the TEC or Thermoelectric Cooling Device. Once the new chip is installed replace the CCD housing and secure it with the long brass bolts. Do yourself a favor and make sure that the glass is very clean both on the housing and on the CCD window before closing it. Any dust specs on these surfaces will show up as circles or doughnuts (depending on your telescope) when you try to image forcing you to take flat field frames. Don’t close the rest of the camera yet as we now have to calibrate it for the new chip. For calibration we will run a few tests with the camera open and running so adjustments can be made to 2 variable resistors located on opposite sides of the printed circuit board. VR1 is located close to the center of the PCB and is pictured on the right. Click on the image for a close up. 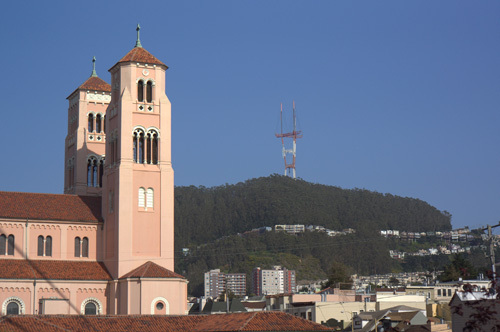 First of all fire up the camera and take a test image through a pinhole or with a camera lens attached. Hopefully you’ll get a normal image and we can move on to dark frame adjustment. If there is a problem, power off the camera and double check the obvious. If the problem persists try reinstalling the color chip and taking an image with that. For the dark frame test we need to let the camera cool down for about 5 minutes. The cover the camera so no light can make it to the CCD chip (Remember how sensitive these chips are to light! I actually put my camera in a black cloth bag as well as covering the CCD.) and take a 1 second exposure and look at the histogram of the dark frame you just took. The histogram of a properly calibrated camera should look a lot like the one on the above. (Note: I used the MX716 version of the software – StarlightXpress Star_MX7 v2.0e (04/06/2002)) There should no more than 1 or 2 entries in the VAL field and the values should range between 006 and 016. If the values are greater than 16, use a small flathead screwdriver to turn VR1 a few degrees anti-clockwise. 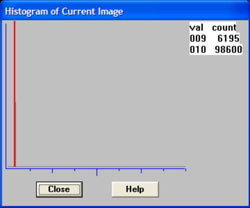 Then take another 1 second dark frame and examine the histogram values to see if further adjustment is needed. If the values are lower than 6, use a small flathead screwdriver to turn VR1 a few degrees clockwise and repeat the dark frame histogram process until the values are correct. After this process is complete it is a good idea to take a 5 minute dark frame to make sure the darks are free of hot spots bright streaks. There will probably be a brighter area in the upper left area of the frame. This is caused by the output amplifier and should be quite faint. If you have the chance it would be a good idea to compare your dark to the dark frame of a calibrated camera of the same type. For the calibration of VR2 we are going to need a light with a narrow a beam as possible to simulate a star. There are 2 methods for doing this – one easy way is to shine a light or a laser at a spherical Christmas tree ornament to at a ball bearing and to focus the CCD and camera lens or telescope at the reflected beam. 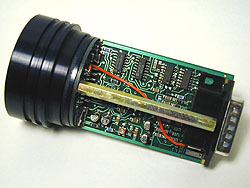 The method I used was to tape a high power eyepiece to a flash light as seen in the image on the right. 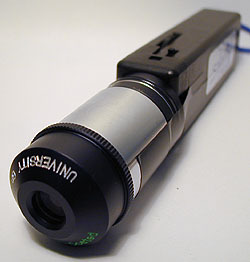 The eyepiece will focus (or narrow) the beam of light to a finer point. I used a University Optics 12.5mm Orthoscopic. I found the beam to be too bright even with the flashlight on the lowest setting so I added a variable polarizing moon filter to dim the light even more. VR2 is located on the opposite side of the PCB towards the edge and front of the camera as seen in the picture on the right. 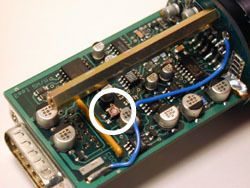 This variable resistor controls the ABG (Anti-Blooming Gate) bias on the CCD chip. Anti-blooming prevents streaking and bloating of bright stars but slightly and affects linearity. ABG can be effectively turned off by turning this VR about 20° anti-clockwise. To calibrate VR2 we need to focus the camera on a light source (as previously described) in a dark room and take a 1 second integration. My camera’s ABG bias was set too low and my image of the light source looked a like the image on the right. 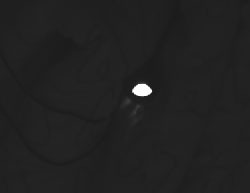 Instead of being as close to a point of light as possible, I got an oval due to “bleeding” caused by anti-blooming being almost set to the off position. To calibrate the camera take a 1 second picture of your light source. If the resulting image looks like the middle picture on the right and/or if there is a bright streak in the image then the ABG gate is set too low. Turn VR2 a few degrees clockwise and take another integration. 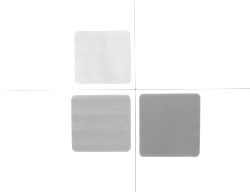 If the image is gray or grainy then the ABG is set too high. Turn VR2 a few degrees anti-clockwise and take another integration to test the result. If you overshoot too much in the clockwise direction the camera sensitivity will be decreased by too much anti-blooming. If you overshoot anti-clockwise sensitivity will be higher but stars will be bloated and oval and streaks will appear so proper calibration is critical. This is the hardest and most painstaking part of the calibration to get right. 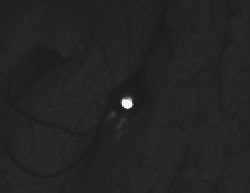 My suggestion is to turn VR2 anti-clockwise until you get a bloated star image like mine and then take 1 second integrations turning VR2 clockwise 2 or 3 degrees at a time until the blooming just disappears. For the final step in calibrating the camera point it at a white target and take an integration that results in a mostly saturated image. Here I printed a 4 colored boxes and a thin crosshair for reference. 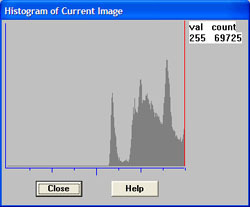 The resulting histogram should have a major peak at a VAL of 255. If the peak does not reach a VAL of 255 or if the image look gray or grainy then VR2 is set too far clockwise and you must go back and adjust it. And that is it! You now have a MX7 with either the color or the mono chip installed, calibrated and ready to go!